when i returned from my two burlesque classes last monday night, dear eden had this lovely, colorful, tasty meal whipped up for moi and my oh-so-sore abs (merci chair workout!). my plate looked like a work of art so i snapped this photo before even realizing how incredibly yummy the quinoa burgers would be. truly a treat - especially with fresh avocado slices on the side. 30 percent of magnesium daily value (beneficial for people with migraine headaches); 28 percent daily value of phosphorous; iron (15 percent); copper (18 percent); and manganese (almost 60 percent)"
convinced of the goodness? here's who to make it . . . In a food processor, add the onion and garlic and pulse until finely chopped. Add the chickpeas and oats and pulse until well mixed. Don’t puree the mixture. Remove the mixture to a large mixing bowl, and stir in the quinoa, parsley, poultry seasoning, smoked paprika, Bragg Liquid Aminos, and chickpea flour. Stir in 1 to 2 tablespoons water, if needed to help the burger mixture stick together, although you don’t want to make the mixture too moist. Add salt and pepper to taste. Thoroughly mix the ingredients, cover the bowl and refrigerate for 15 minutes. Form the burger mixture into 6 balls, and press into 3 1/2 to 4-inch patties. Heat a large cast-iron skillet over medium-high heat, and lightly coat or spray with olive oil. 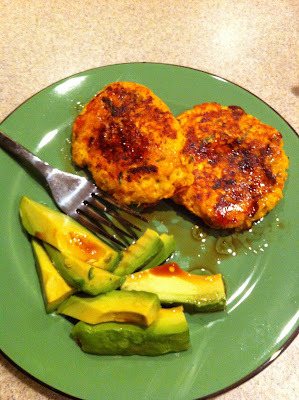 Place the brown rice flour on a small plate and dust the burgers on all sides with the rice flour. Add the burgers to the hot skillet. Cook the patties for about 5 minutes, or until nicely browned and crispy. Reduce the heat to medium, if necessary, to continue cooking without burning. Add more olive oil as necessary, to keep the burgers from sticking. Flip the burgers over and cook on other side. Remove the burgers from the skillet and let sit for 5 minutes before serving. Letting them rest will give them a better texture. Serve the burgers on a fresh, whole grain bun with all the fixings: lettuce, tomato, sauteed maple onions – and don’t forget the mustard! * recipe from the vegan project as found in the vegan diner. Three cheers for quinoa! I'm definitely trying this recipe.